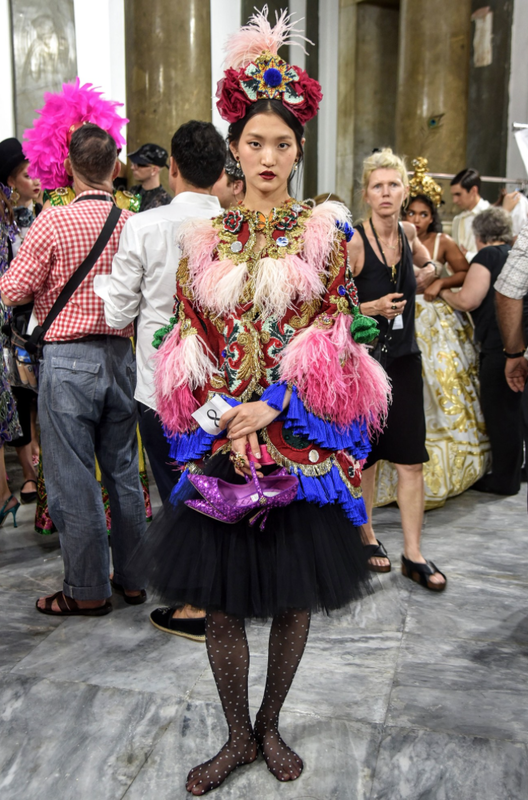 The annual spectacle of Dolce & Gabbana's 'alta moda' show graced the streets of Palermo in Southern Italy with embellishment, sequins and gowns galore, with stunning headpieces adding the final touch to create a glistening show under the falling Sicilian sun. The Italian duo, heavily inspired by the heritage and culture that Italy has to offer as inspiration, used striking prints and bold, clashing colours to pay homage to the vibrance of the capital city. As around 430 guests and clients waited attentively for the 126-look haute couture show to begin, Domenico Dolce put the finishing touches to skirt hems and red lips, joyously declaring, "Palermo! For me, it is my life, my memories - my family, my grandmother, my school, my father, my mother - my life." With a line up of bright and standout looks adorned with as much details as possible, the collection went from cute and sporty to floor-sweeping ball gowns and grandiose feather headdresses aloft perfecting pruned models. But under the surface of this extravagant show, the collection also revealed fragments of Palermo's dynamic past, with references to its of Arab, African, Spanish, Middle Eastern and Catholic aspects as well as Il Gattopardo, or The Leopard, the book that defined Palermo's heritage. The fusion of culture, heritage and fashion delivered by Dolce & Gabbana showed the talent and detail the pair are so famously known for. Watch the show here, at www.youtube.com or scroll down for more pictures.